Happy Saturday! Halloween is just two short days away! I enjoy this season so much and I'm disappointed that this year I will be missing out on meeting and greeting the trick or treaters. (My son and I sing in a community choir and with concert just a few weeks away, we could not afford to miss our regularly scheduled Monday night practice). 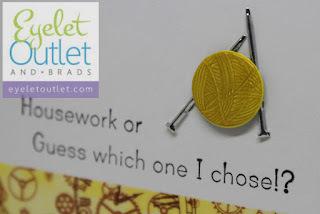 I saw another interesting fold tutorial over on Splitcoaststampers, and so I thought I would give it a whirl! It turned out to be fast, easy and fun! 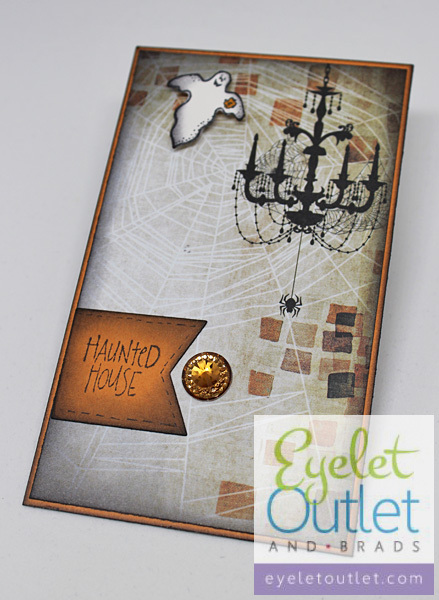 The design is great for coordinating prints and small stamps and fits into a regular envelope. I used some cute skull and witch's hat brads, some glittery washi tape, and a few glossy enamel dots for accents. Gotta love that grumpy frog face! 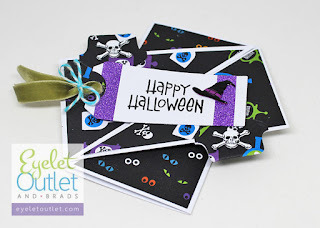 Have a great weekend, and a fabulously fun Halloween! Can you believe that October is more than half over already?! The holidays are just around the corner! There's so much to do and so little time, one has to set some priorities! It's easy to get caught up in the whirlwind, though, so we should not feel guilty for setting aside some down time to take care of ourselves! That's what this card is all about! Needles and yarn from our new set of knitting brads create a focal point and complete the sentiment of this uncluttered layout, with washi tape borders that are in keeping with the theme. It's hard to be in the mood to knit (or spin) in Florida when the weather is hot, but I've got a stash of fiber and yarn that will be coming out to keep me company when it gets a little cooler! Hi all! 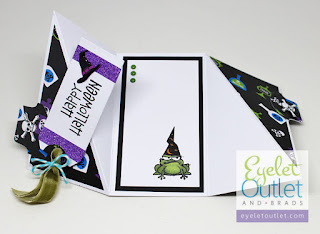 I'm here with a super simple, kinda creepy, quick Halloween card using one of my favorite Halloween stamps (from Memory Box). 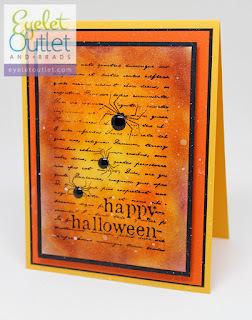 Traditional Halloween colors, some glossy adhesive enamel dots in two sizes, and a few splashes of diluted white ink are really all this design needs, making it the kind of card that would be easy to mass produce. Hello again! I'm back with more Halloween decor! 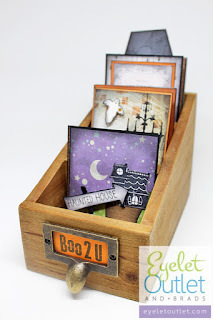 Last year I bought this cute little library drawer as part of a Christmas kit, and I decided that it would be fun to change out the cards inside for the various holidays, so here's a little sampling of what's in it for Halloween. The cards in the first slot are ATC sized. Here's a haunted house street sign embellished with a glittery enamel dot, pointing the way to the spooky house up on the hill. The next slot is a little deeper. 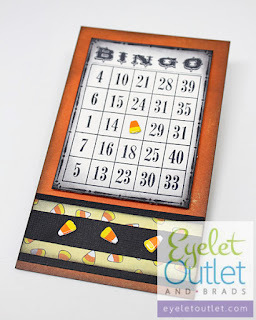 It's got a Bingo card with mini candy corn markers, and another haunted house card. 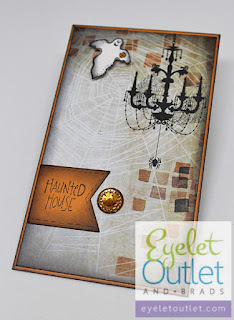 This one is a clean and simple layout where the patterned paper does all the work. It is accented with a ghost and a sparkling champagne jewel. 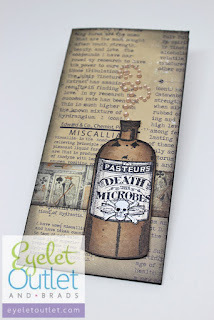 My dad was a pharmacist, as was my grandfather, so I am always drawn to old bottles...here's a potion bottle of Halloween microbes, complete with skull and crossbones warning, and swirling jewel bling "aroma." 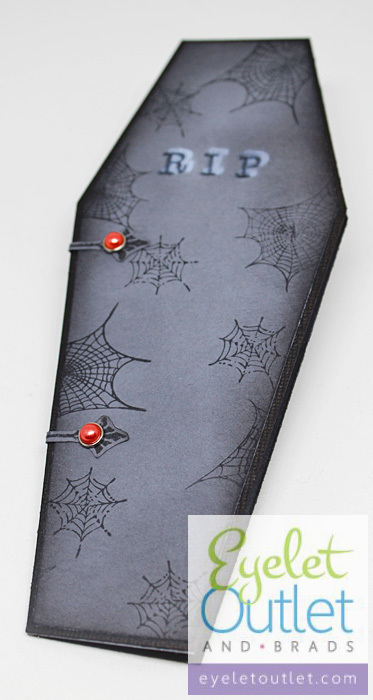 The tallest card in the back slot is a coffin-shaped card. 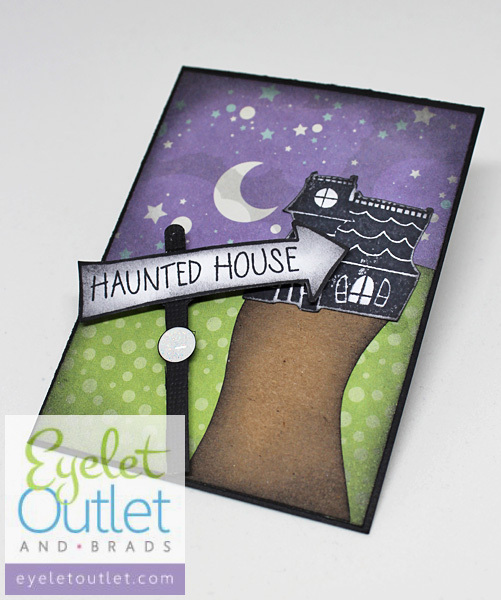 I really wanted to stamp this one with wood-grain, but didn't have a wood-grained stamp, so spider webs had to do! 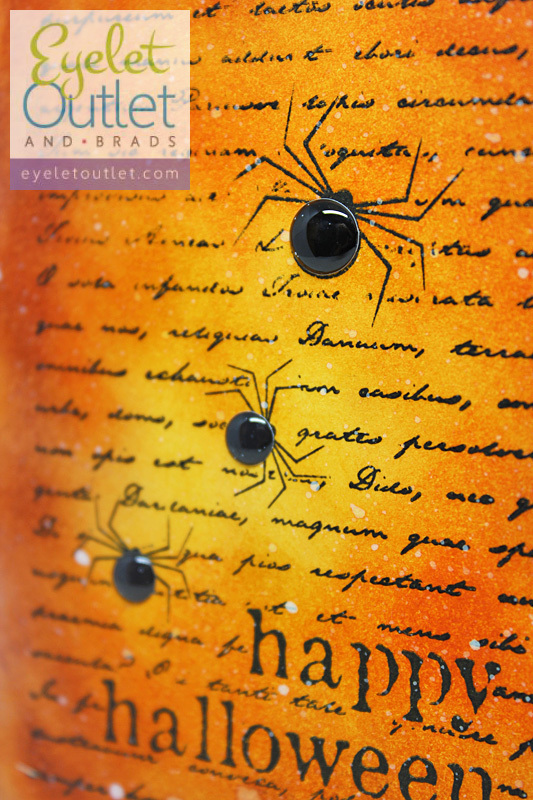 The hinges are nailed with orange pearl brads which brings in some Halloween color, but screw brads might have been even cuter! I had a blast working on this last weekend. I sat on the floor surrounded by Halloween stamps and papers and inks, watching football and crafting all day. It was fun to use some of my favorite papers from my stash and a few stamps that haven't seen the light of day in a year or too. I will be adding to this little collection as the days, weeks, and even years go by! Such a fun project!